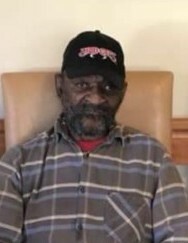 On Saturday, April 6, 2019 Robert Kearney departed his life at Senters Rest Home in Fuquay Varina, North Carolina following a long illness. He was born December 8, 1946 to the late Jeremiah and Rhoda Kearney in Franklin County, North Carolina. Robert never met a stranger and he knew everyone. He was kind and would give to anyone. In addition to his parents, he was preceded in death by three brothers and two sisters, Jeremiah Kearney, Jr., Joseph Kearney, Grover Lee Kearney, Eliza Ann Holden and Betty George. Robert leaves to cherish his memory: his sister, Inez Taylor of Kittrell, NC; four nephews, Michael Taylor (Shauna) of Brooklyn, NY, Sean Eric Taylor of Melbourne, FL, Phillip George of Brooklyn, NY and Jason Taylor (Chaya) of San Antonio, TX; six nieces, Rhonda Taylor of Kittrell, NC, Samantha Milford (Darray) of Raleigh, NC, Tisha George of Brooklyn, NY, Shameeka Taylor (Dalvin) of Louisburg, NC, Davida Taylor of Rocky Mount, NC and Sierra Taylor of Kittrell, NC; a host of great nieces and great nephews, other relatives and friends.